This event, organized by the Climate and Clean Air Coalition to Reduce Short-Lived Climate Pollutants (CCAC), convened on 16 November 2016 in Marrakech, Morocco, on the sidelines of the 22nd session of the Conference of the Parties (COP 22) to the UN Framework Convention on Climate Change (UNFCCC). The event aimed to provide a platform for discussions on: national practices/experiences in combining efforts on mitigation of short-lived climate pollutants (SLCPs); how SLCPs fit into Nationally Determined Contributions; and the expected or experienced multiple benefits for health and sustainable development. Helena Molin Valdes, Head of the CCAC Secretariat, opened the event and welcomed participants. 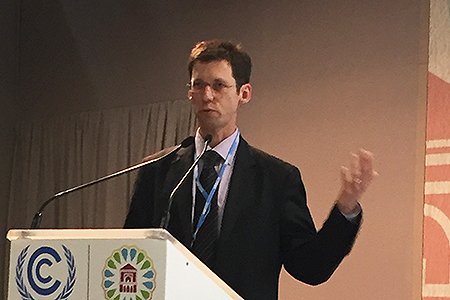 Mark Lawrence, Managing Scientific Director, Institute for Advanced Sustainability Studies (IASS) Potsdam, moderated the event, and presented on near-term actions to accelerate pathways towards the climate target. He said any hopes of remaining below a 2°C temperature rise will require complete decarbonization by 2050, and transformation of the transportation and energy sectors. Presenting the science perspective, Veerabhadran Ramanathan, Distinguished Professor of Atmospheric and Climate Sciences at the Scripps Institution of Oceanography, University of California at San Diego (UCSD), via video, noted the need to decarbonize, and said to realize the Paris Agreement’s goals, public support for drastic actions is required. Durwood Zaelke, President, Institute for Governance and Sustainable Development, highlighted solutions to implement the Paris Agreement, including reducing SLCPs, which brings co-benefits and will help avoid reaching the tipping point. On political support for reducing SLCPs, Ken Alex,Director of the Governor’s Office of Planning and Research, California, outlined California’s efforts and legislation in reducing SLCPs, mentioning solutions to capture and reuse methane to replace fossil fuels. On financing SLCP mitigation, Roland Kupers, Associate Fellow, Smith School of Enterprise and the Environment, Oxford University, recommended putting a price on methane and gathering better quality data. Eduardo Bitran Colodro, Secretary General, Chilean Economic Development Agency (CORFO), and former Minister of Public Works, Chile, advocated for a circular economy model to reduce methane emissions in the agricultural sector. Stefanie Lindenberg, European Investment Bank (EIB), said that the EIB must include SLCP reductions for transport projects and enhance finance for waste projects. Stephen Hammer, World Bank, outlined the report on ‘The Cost of Air Pollution: Strengthening the Economic Case for Action,’ emphasizing that opportunities for co-benefits exist, especially in urban areas. In closing, Valdes introduced a video on the Breathelife 2030 campaign, which highlights the threats of air pollution to children’s lives around the world. She thanked participants and closed the session. IISD Reporting Services, through its ENB+ Meeting Coverage, has provide daily web coverage and a briefing note from the event on Actions on near-term climate mitigation to protect air quality and achieve the Paris climate goals and the SDGs. Panellists listen to Eduardo Bitran Colodro, Secretary General of CORFO, and former Minister of Public Works, Chile, outline initiatives for financing SLCP mitigation projects. Mark Lawrence, Managing Scientific Director, IASS Potsdam, said that SLCPs are responsible for half of current global warming. 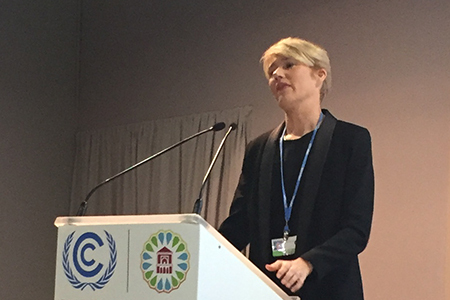 Stefanie Lindenberg, EIB, noted that the EIB is the biggest multilateral investment entity for climate finance around the world.